I struggled with this image, trying to clean it up, make the buildings sharper, get rid of the mist, make the river look better…… and I finally realized that NO! this is what I saw and felt. I took this during my first day in China after a walk along Nanjing Lu. This is Shanghai in misty rain. 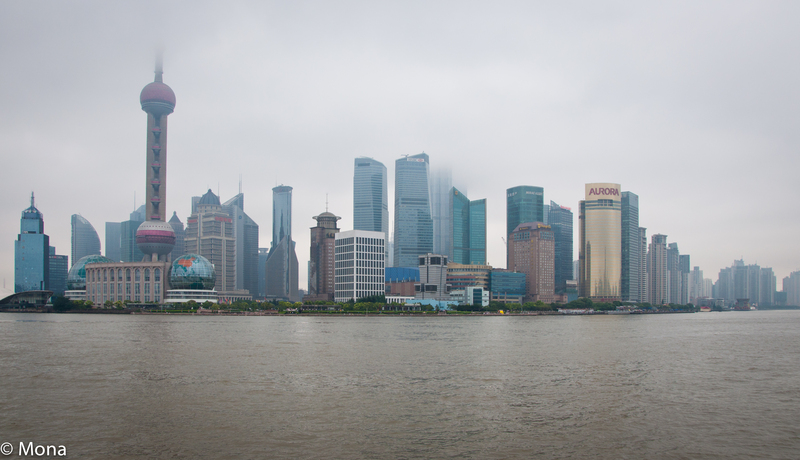 I am looking at the Pudong Skyline located on the east side of the Huangpu River. Behind me are the beautiful old buildings of the Bund. I was in China for 5 1/2 weeks and never saw the sun; occasionally I saw a hint of blue sky. Not every day was overcast like this, however; many days the skies were simply flat gray. I wonder if I stayed there for a year, would see the sun and blue skies? It must happen because I’ve seen spectacular images of blue, sunny, panoramic views. This image, though, is my experience. It casts a bit of mystical mood for me…a softness which I like. I definitely consider myself “liked” and I will now stop by f-stop fantasy. This is interesting; my wife and I went to China recently (I’ve been busy and have yet to post on Shanghai) but I loved the city. But more importantly I’ve since found out we were very lucky with the weather, or rather the lack of pollution. Xian was the only city we had problems with (no sun, very grey and dirty). Shanghai in particular was incredible though! And I also liked Hong Kong if you get a chance to go. So you were the one who took my sun? Isn’t Shanghai a great city? I did a lot of walking … some days for hours and hours. We stayed in the French section with beautiful mature trees (French Maple) and old buildings. Within a mile or so (a comfortable walk), we were in the fancy shopping district; however my favorite area is definitely Nanjing Lu (or Road) and the Bund. I’m looking forward to returning and exploring more of the city. Xian sounds interesting…I don’t know if I can get as far south as Hong Kong…maybe another year.